SOUND OF ASFALT is a thought-provoking coming of age novel describing the dark sides of the world's richest and happiest country. In Oslo, we follow a boy facing challenges of many kinds, with his family falling apart, bullying and a city that is becoming bigger and bigger. This novel describes Norway’s capital in the happy 80s and 90s, where Nordic optimism fight the individual’s struggle for existence. We get under the skin of a society where oil prices lubricate both social institutions and private wallets, while the development leaves open wounds to many of those who fall outside the streamlined machinery. A boy from Oslo tries to find his place- in the family; at school and in general. The main character in the novel experiences it as if there is no room for him in society – until a friend invites him home to his house and puts on a CD he has never heard of before. In the music these guys find someone who can address the meaninglessness they often feel. With Norway’s biggest rocker of all ages (Joachim Nielsen) as a musical backdrop, we are drawn into a literary landscape filled with contemporary references and depictions of an environment and an entire generation of ideals. What happens to us during the vulnerable time of becoming adults when the dreams we have prove to be unattainable? In this novel, learn to know an earlier and more rough environment than the current SKAM Internet phenomenon, which today fascinates youngsters and adults worldwide. The language is hard and brutal. Sad and funny. Without any sentimental wrapping. Sound of Asphalt oozes vitality. 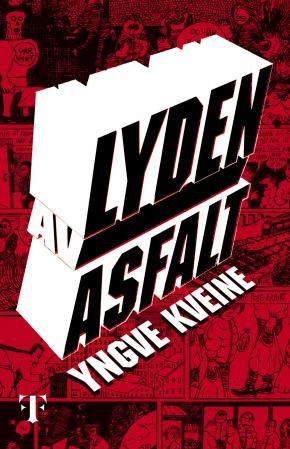 With Yngve Kveine's pen, it becomes powerful reading!